Today, the Supreme Court adjourned the matter for 8 weeks, in order to give the parties time to review translations of submitted documents. Further, it suggested that a "Court appointed and Court monitored" mediation could begin to take place in the interim period, before the next hearing. The 5 Judge Constitution Bench comprising Chief Justice Gogoi and Justices SA Bobde, DY Chandrachud, Ashok Bhushan and Abdul Nazeer is hearing the matter. The Court is hearing an appeal to the 2010 Allahabad High Court judgement, which divided the Ayodhya title equally between three parties: the Sunni Wakf Board, the Nirmohi Akhara and Lord Ram represented by the Hindu Maha Sabha. In 2018, a 3 Judge Supreme Court Bench ruled that the matter need not be referred to a 5 Judge Constitution Bench. The Sunni Wakf Board had requested the Court to assign the matter to a Constitution Bench so that the Court could reconsider its 1994 Ismail Faruqui judgment. In Ismail Faruqui, the Court upheld the 1993 legislative Act which the State used to acquire the land at Ayodhya, on the grounds that mosques are not an essential feature of Islam in matters of State land acquisition. In ruling that Ismail Faruqui does not require reconsideration, the Supreme Court limited the scope of the matter to a land dispute. In January 2019, CJI Gogoi assigned the matter to a 5 Judge Constitution Bench, in effect overturning the 2018 judgement. By assigning the matter to a Constitution Bench, CJI Gogoi expanded the scope of the matter beyond only questions pertaining to a land dispute, but also questions pertaining to the essential religious practice doctrine. On 10th January 2019, Justice UU Lalit recused himself from the freshly constituted Constitution Bench, citing a conflict of interest. As a result, the matter was assigned to a new Constitution Bench and listed for today, 26th February 2019. CJI Gogoi supplied all the counsels with the report of the Secretary General of the Court, which details the readiness of submitted documents. In particular, the report focuses on translations of documents. There are documents in Persian, Sanskrit, Arabic, Gurumukhi, Urdu and Hindi which must be translated into English, as per Order VIII, Rule 2 of the Supreme Court Rules, 2013. CJI Gogoi emphasised that around 20,000 pages of the Court record are not in English. Note that the Bench had ordered the Secretary General to prepare the report in the previous hearing, 10th January. CJI Gogoi urged all the parties to raise any objections they had to the report immediately. He specifically asked whether they found the official translation by the State of Uttar Pradesh of the oral evidence of the Allahabad High Court hearings acceptable. He emphasised that once this new Constitution Bench began hearing oral arguments, it did not want the counsels to dispute the veracity of the translations, further delaying proceedings. Senior Advocate CS Vaidyanathan, who represents Ram Lalla, argued that all parties ought to have already reviewed the translations, emphasising that the UP translations have been ready for over a year. He referred to the 5 December 2017 Supreme Court order, wherein the Court directed the counsels for the parties to notify the Registrar, if they found there to be a problem with the translations. CS Vaidyanathan highlighted that no counsels have raised any objections to the translations to the Registrar. He also referred to a 10th October 2015 order, which states that the counsels for the parties should appear before the Registrar to agree upon "a satisfactory and agreeable method" for translating, collating, compiling and filing documents. He emphasised that this order was issued over 4 years ago. On the other hand, Senior Advocate Rajeev Dhawan representing the Sunni Wakf Board submitted that he had not yet examined the translations. He argued that the parties should have time to examine the official translation further, given that every document "has relevance". Responding to CJI Gogoi, he submitted that they will require between 8 and 12 weeks to examine the translations, not only for correctness but also for relevance. Justice Chandrachud noted two January 2017 meetings of the Registrar, where it was noted that no counsel had gone through all the translations. The Registrar recorded the verification of translations as pending. Leaving behind the veracity of translations, Chief Justice Gogoi and Justice SA Bobde both suggested that the parties could explore the option of mediation under Section 89 of the Code of Civil Procedure. Justice Bobde pointed out that the Court has yet to explore the option. The Bench emphasised that the mediation could occur at the same time the counsels for the parties were reviewing the veracity of translations. In response, the following Senior Advocates stated they would be open to mediation: Rajeev Dhawan (for Sunni Waqf Board), Dushyant Dave (for Mohammad Hashim), Raju Ramchandran and Sushil Kumar Jain (for Nirmohi Akhara). On the other hand, the following Senior Advocates opposed mediation: CS Vaidyanathan (for Ram Lalla), Ranjit Kumar (for Mahant Suresh Das) and Barun Kumar Sinha (for Akhil Bharat Hindu Mahasabh). In conclusion, the Bench directed all parties to examine the translations and raise any objections and/or agreements within 8 weeks. In addition it deferred passing any orders on the question of mediation. 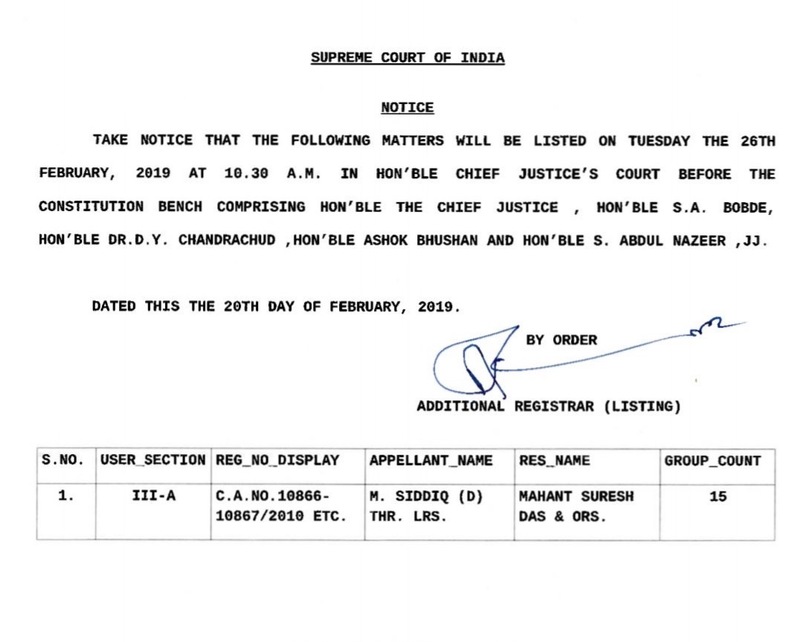 Today's order lists the matter for 6th March 2019, where the Bench will assemble at 10.30 AM "for the limited purpose of passing orders on reference of the dispute to a Court appointed mediation process".